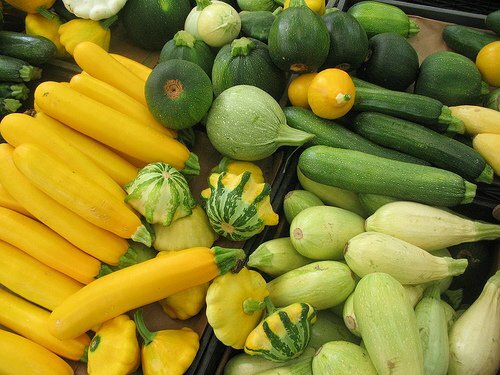 We're not a summer squash family, to be honest. Zucchinis and the yellow ones just kinda leave us--meh. Unless it's roasted with lots of olive oil and parmesan (i.e., disguised as cheese) or shredded and baked in a quick bread (i.e., disguised as dessert), I'd just as soon pass. But winter squash is a whole 'nother deal! From butternuts to pumpkins, they make a welcome appearance in fall. You can find several varieties of winter squash at our Market now, and, as long as you double-check that you're buying an eating pumpkin, and not a carving pumpkin, you can use them almost interchangeably in recipes. The simplest way to enjoy your squash is roasted. No need to peel. Just cut off the stem, slice in half, and dig out the seeds. Brush with olive oil and roast in a 375F oven until soft and collapsed (depending on size, anywhere from 45 min -1 hr). OR, even easier, pile the halves in your largest slow-cooker, set on low, and cook for several hours. Once you've got the roasted squash, the easiest way to serve it up is mixed with butter, brown sugar, and ginger to taste. We probably all have a favorite squash soup recipe, so if you're looking for new uses, try these two. Preheat oven to 400F. Butter a large gratin dish and sprinkle with the Parmesan. Heat the milk with aromatics until it boils. Steep 15 minutes, then strain. Melt the butter in a saucepan. When foamy, stir in the flour and cook over low heat several minutes. Whisk in the milk all at once and stir until it thickens. Add 3/4 tsp salt, pepper, and cayenne. Remove from heat. Beat in the egg yolks one at a time until well blended, then stir in squash puree and cheese. Beat egg whites with a pinch of salt until they form firm peaks. Stir 1/4 of them into the base to lighten the mixture. Fold in the rest, transfer to the prepared dish, and put in oven. Lower heat to 375F. Bake for 30 minutes or until nice and golden and set. Remove, and serve immediately. Delicious! Like a corn pudding, only squash. Stir squash puree in a skillet over med-hi heat to get rid of excess moisture. Mix in cheese and bread crumbs. In each wrapper, place 1 Tbsp filling. Moisten edge halfway around and pinch to seal. Start a pot of salted water boiling while you make the sauce. In a skillet large enough to hold to finished ravioli, melt butter and herbs until lightly browned and nutty smelling. Cook ravioli in simmering water 4-5 minutes. Drain. Add pecans to skillet and ravioli. Cook 30 seconds to heat through. Garnish with more parsley or parmesan cheese. Those lovely squash will keep in your pantry most of the winter, so don't be afraid to load up on the prettiest while we have the Market!